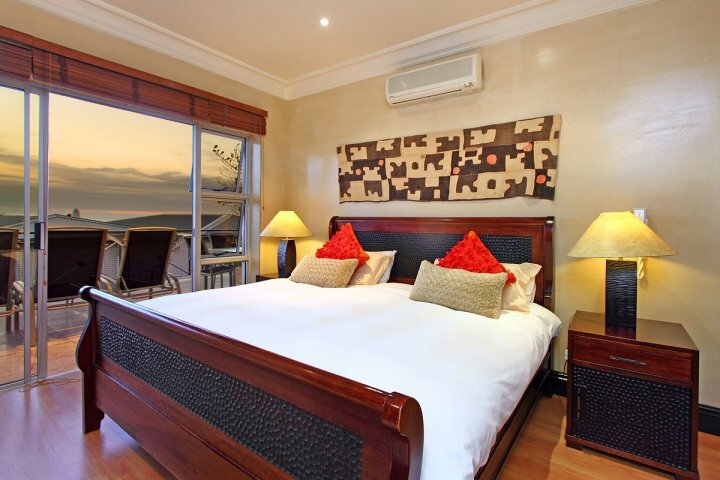 Why stay at BEACH SIDE VILLA AND PENTHOUSE? 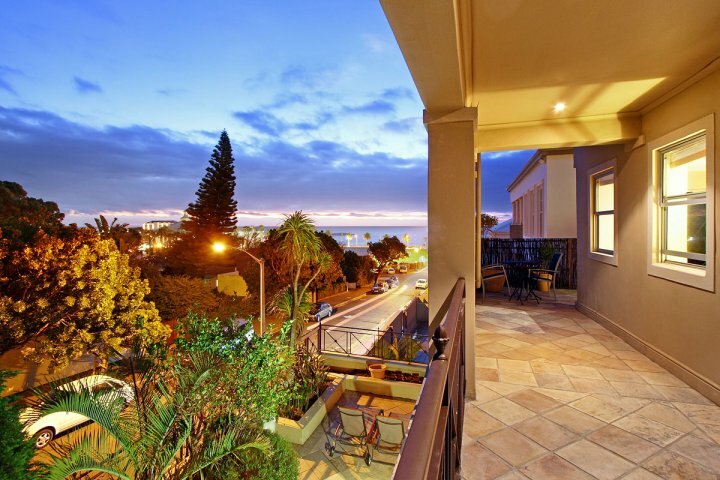 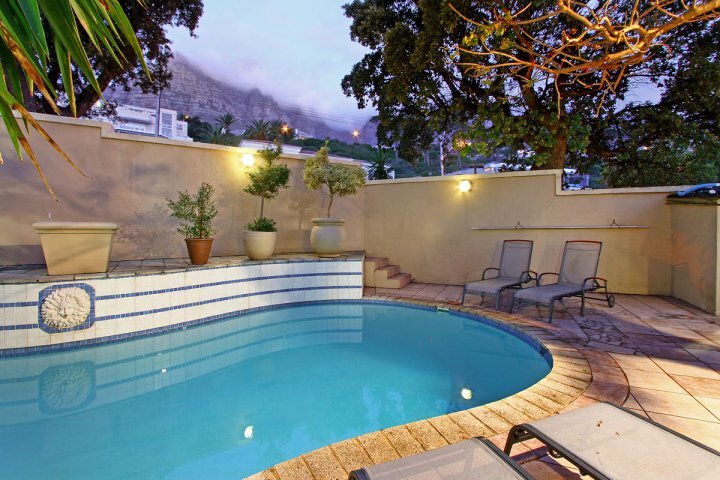 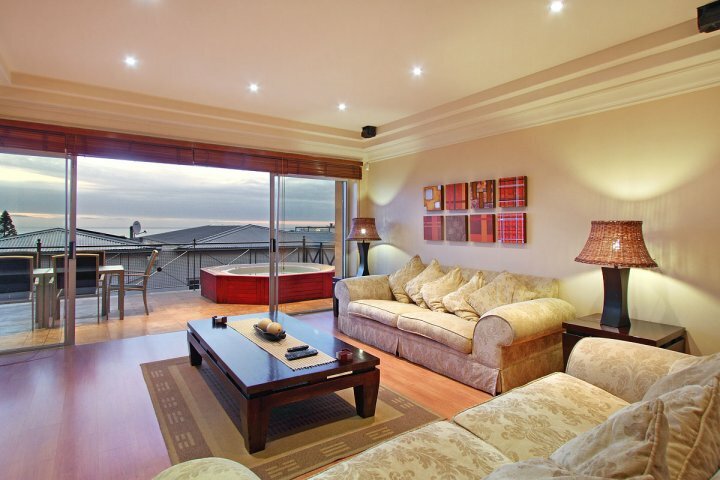 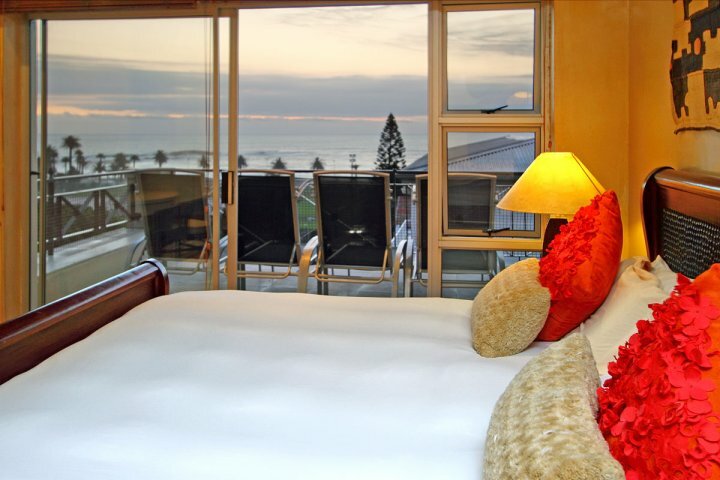 This Villa and Penthouse enjoy wonderful views of Cape Town’s Twelve Apostles and Camps Bay beach and offers luxurious living. 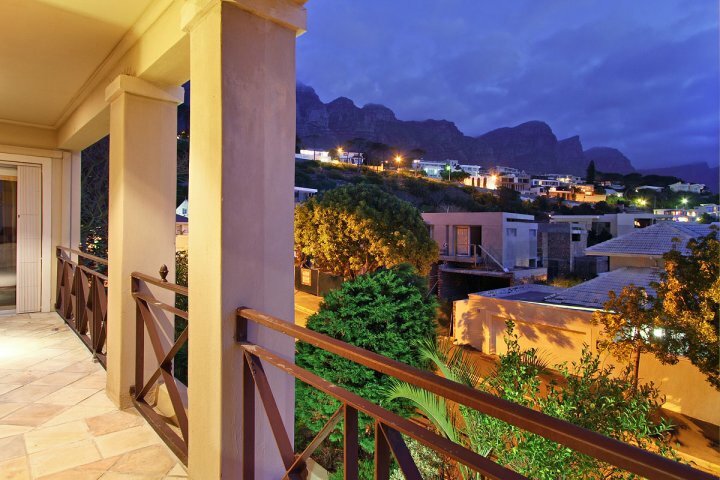 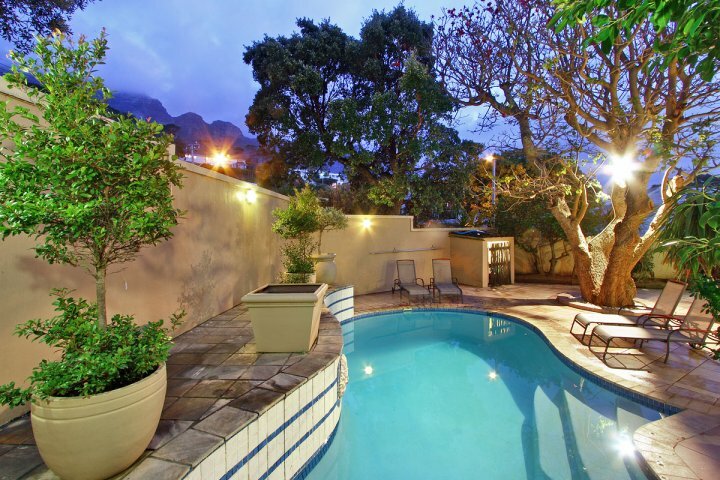 The Villa has been awarded 5 stars by the Tourism Grading Council of South Africa. 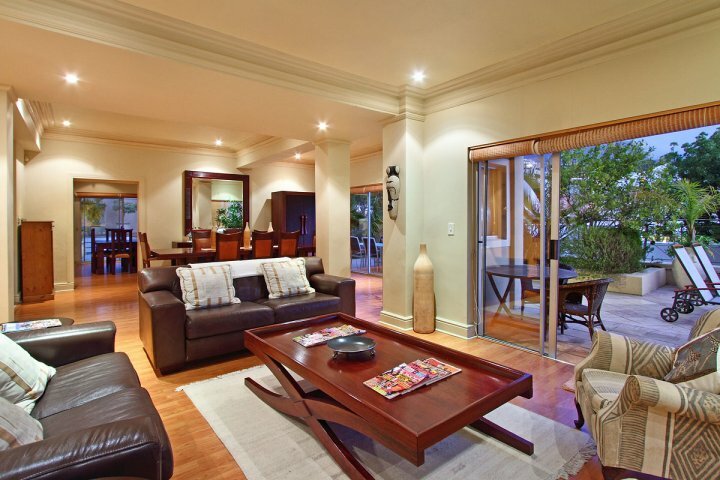 It is a wonderful location! 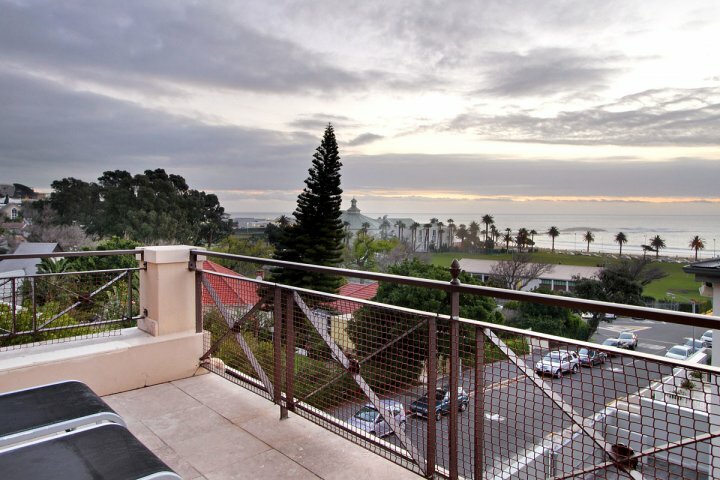 The Villa and Penthouse is three floors connected by stairs and an elevator that runs from the ground floor directly to the second floor, the first floor is accessed via stairs. 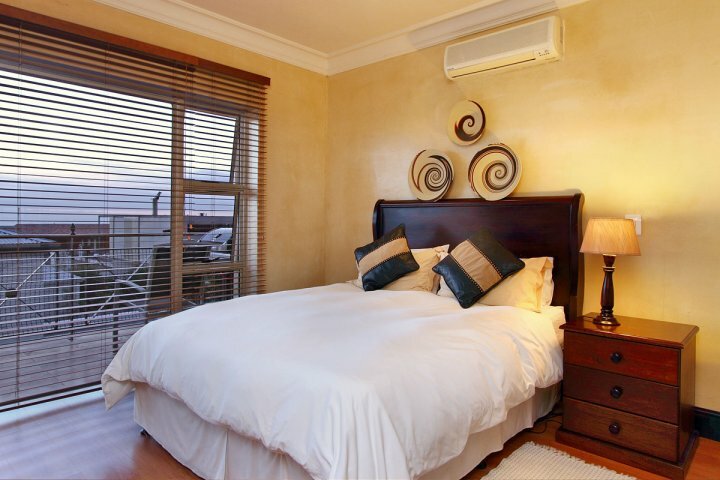 Tastefully decorated in attractive African Renaissance style throughout, it has 8 double bedrooms all en suite with sounds of the ocean. 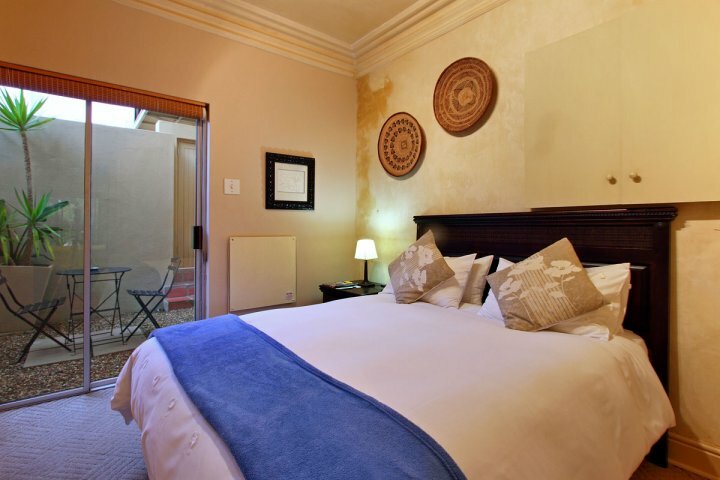 The main bedrooms have a king bed and a queen bed, two of the other bedrooms have double beds and the remaining 4 bedrooms all have twin single beds which can be converted into double beds. 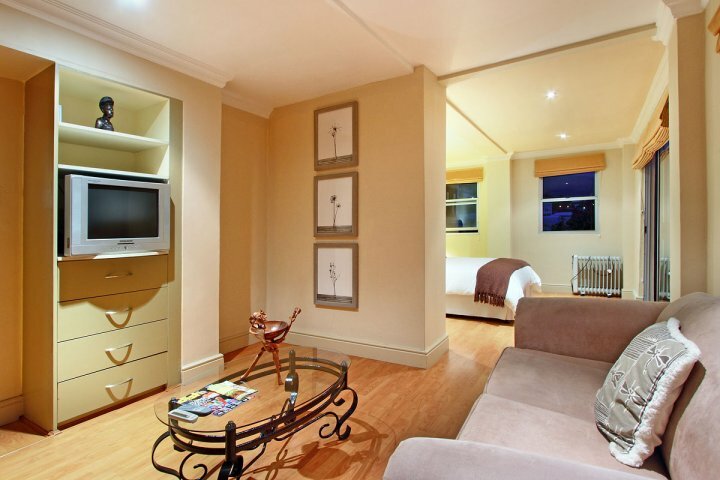 All the rooms have free-standing colour televisions with DSTV/satellite television and hairdryers. 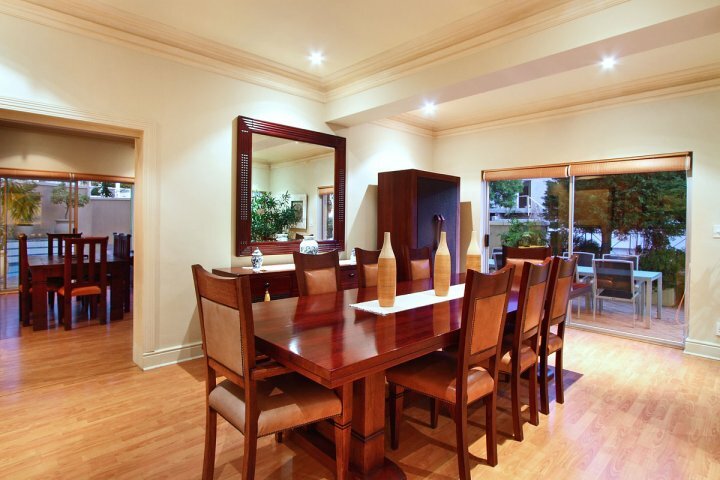 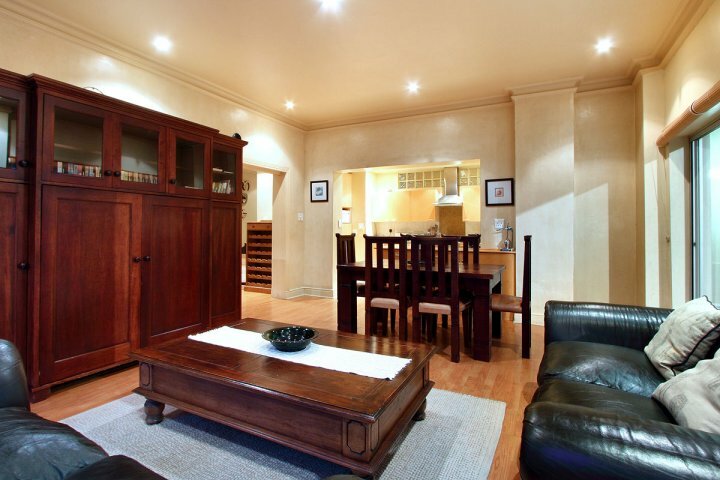 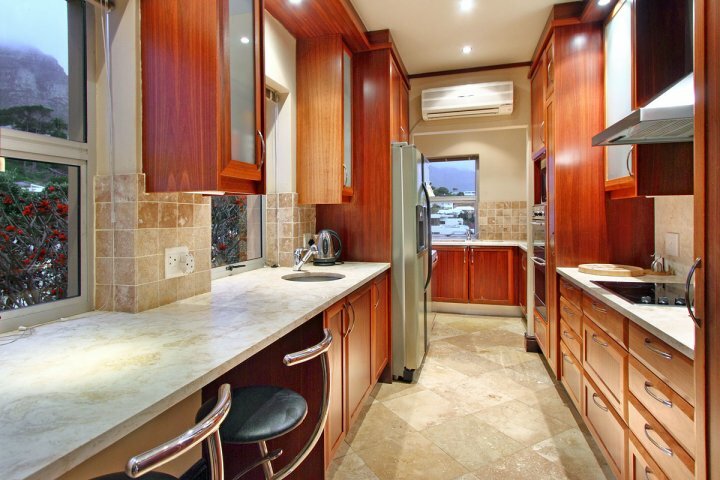 There are two fully equipped kitchens with all the modern appliances including dishwashers. 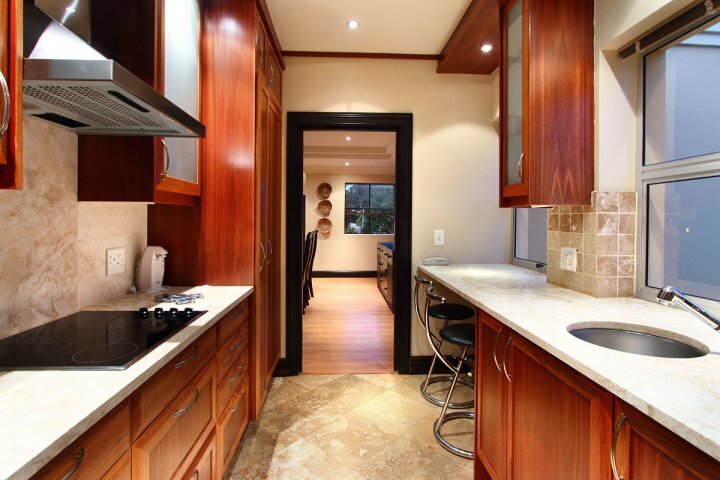 You can actually enjoy beautiful views of Table Mountain and the Cable car from one of the kitchen's windows! 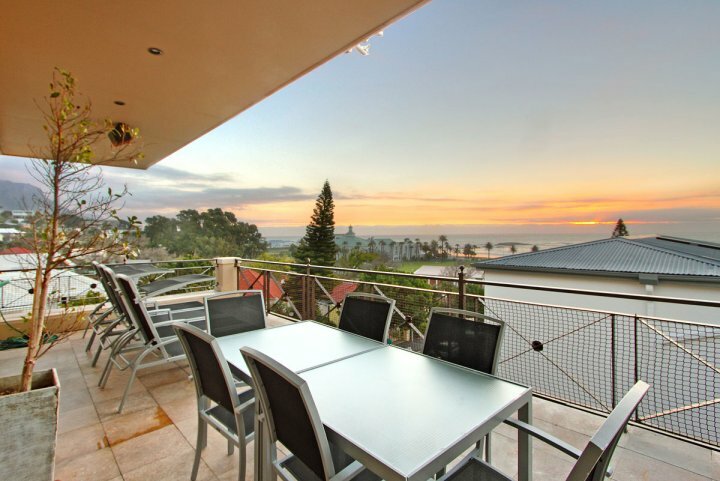 The second floor living areas have a large lounge/dining room fitted with a safe, state of the art audio and TV equipment, a bar, and lead out onto a wrap around patio with heated Jacuzzi, electronic awnings, barbecue facilities, and magnificent sea views. 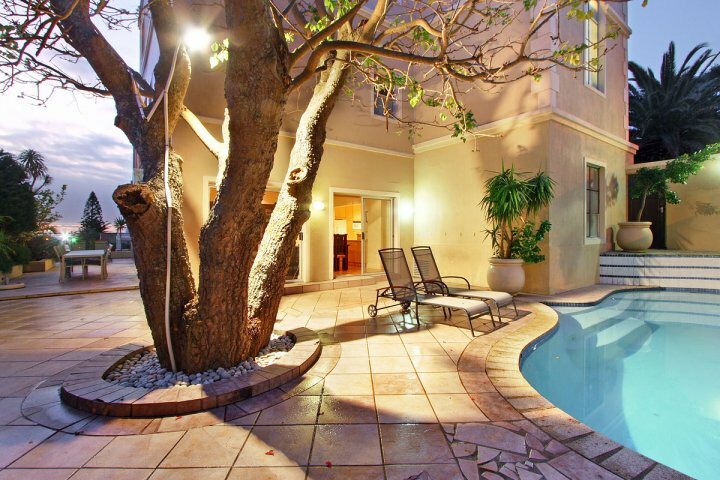 The ground floor living areas feature a spacious living area and an open plan kitchen which leads out onto the beautiful outdoor patio with salt pool. 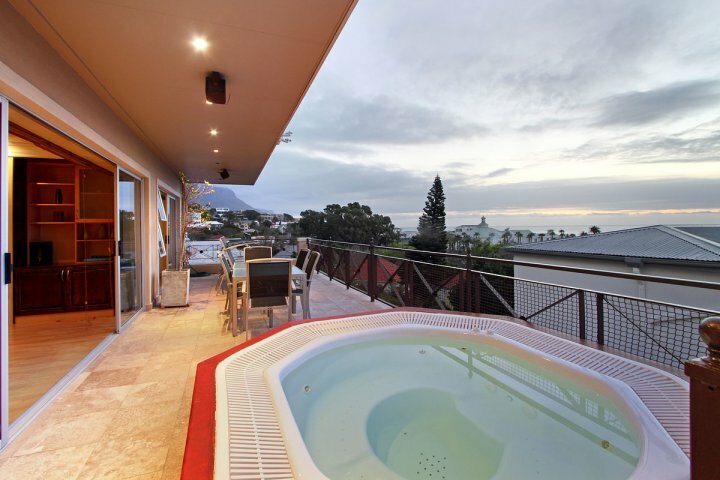 There are stunning views of the sea and mountain from the bedrooms on the first floor; and of the mountain from the pool and patio area on the ground floor. 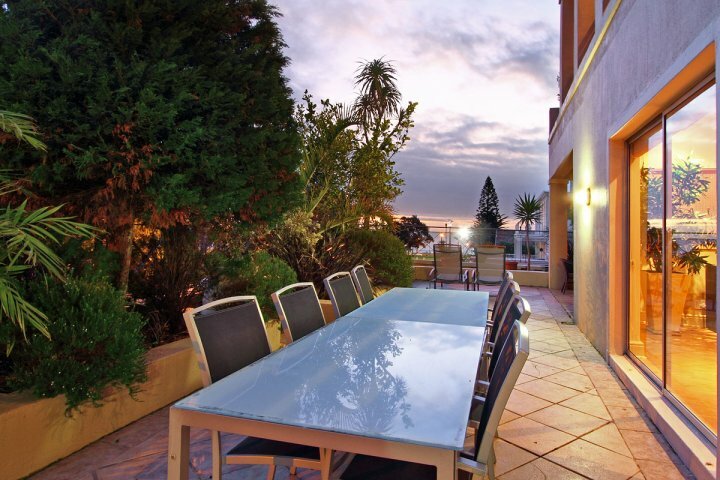 There are barbecue facilities on the patio ground floor and the balcony on the second floor. 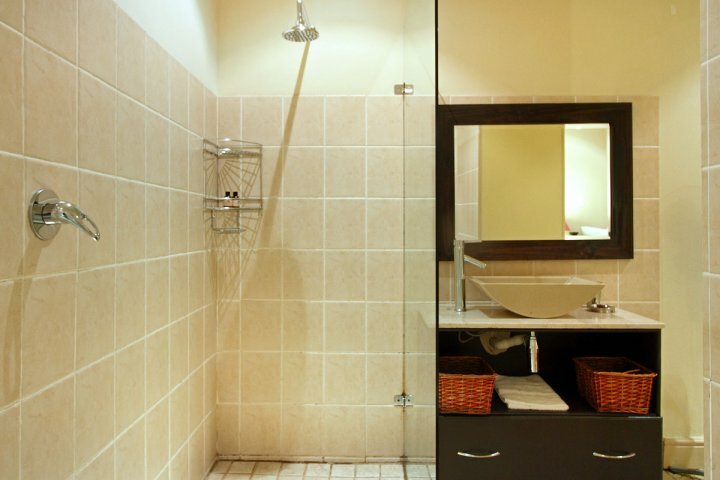 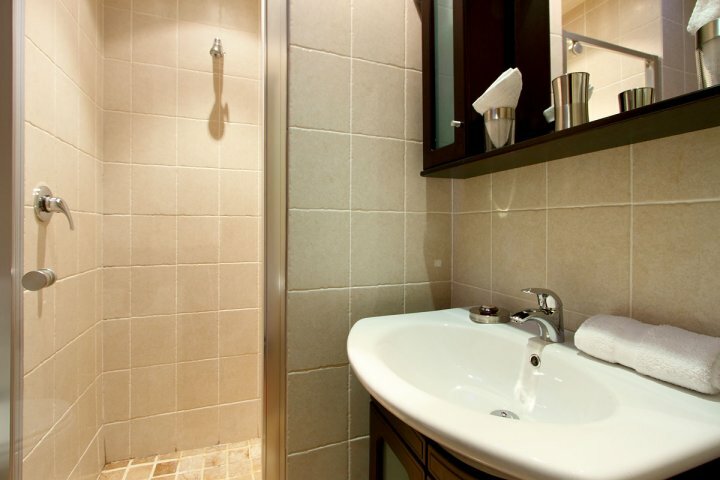 Laundry facilities are on site as well as free wireless Internet. 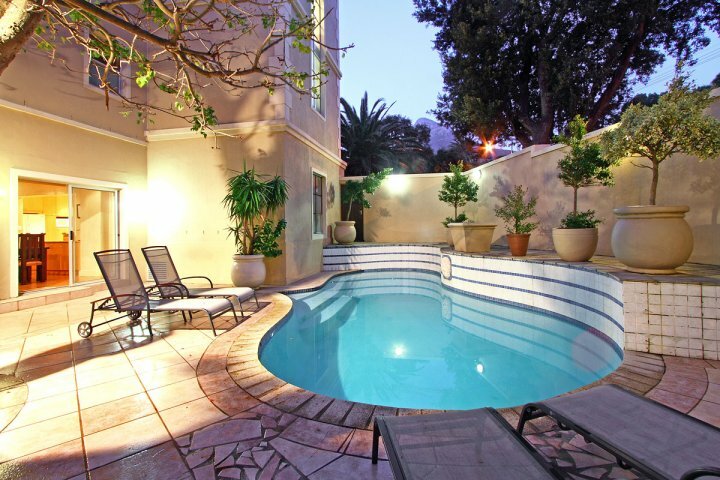 There is secure garage parking for 2 cars as well as off-street parking for another 3 cars. 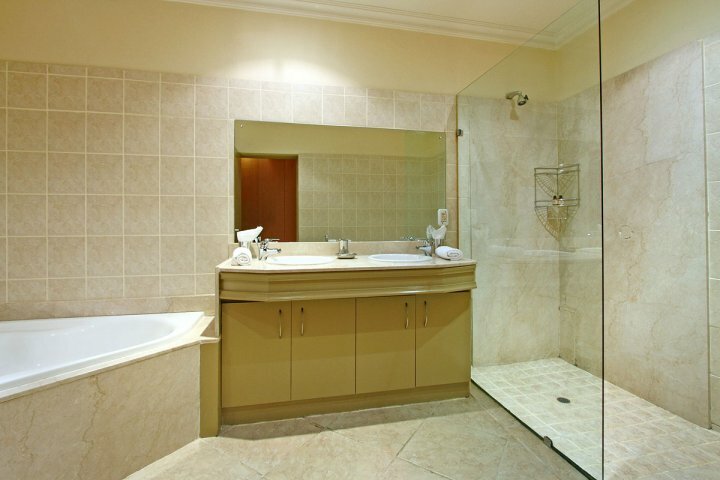 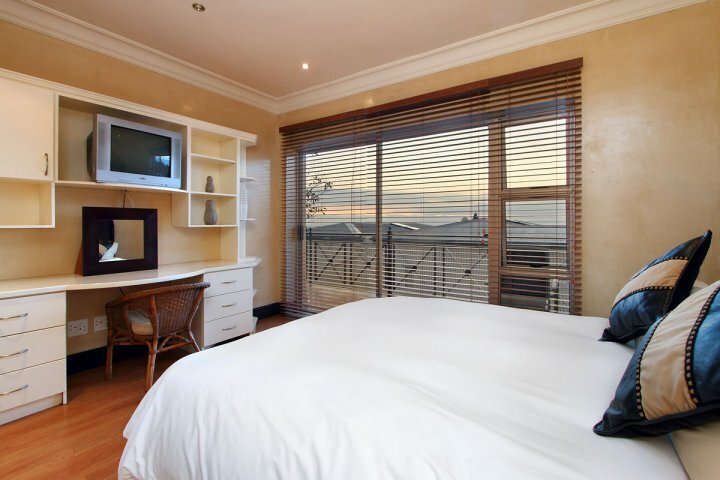 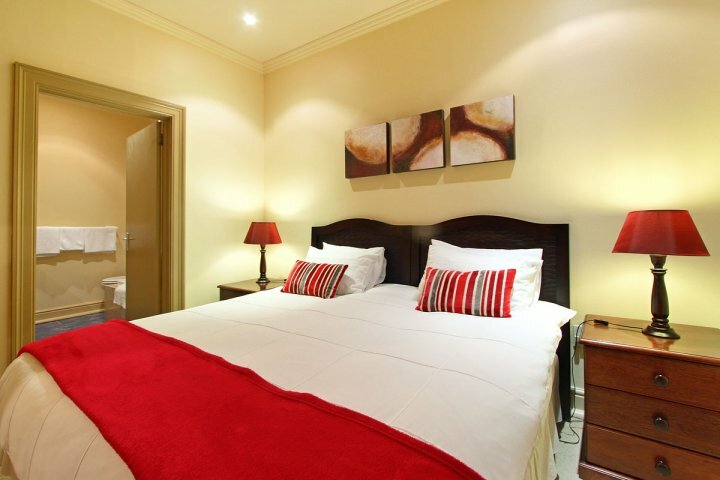 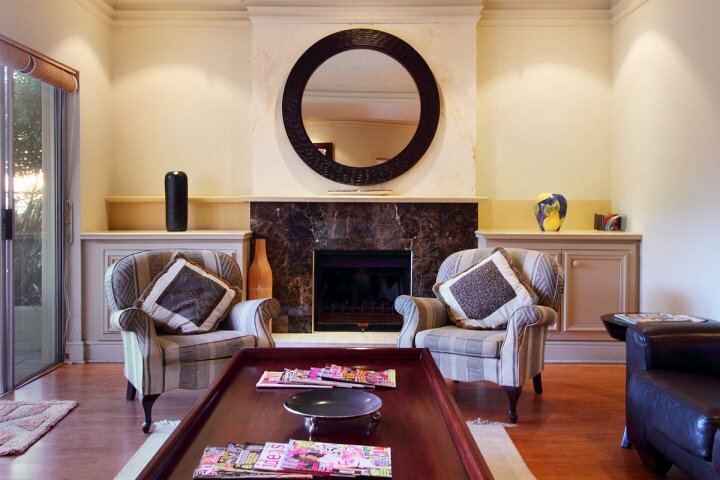 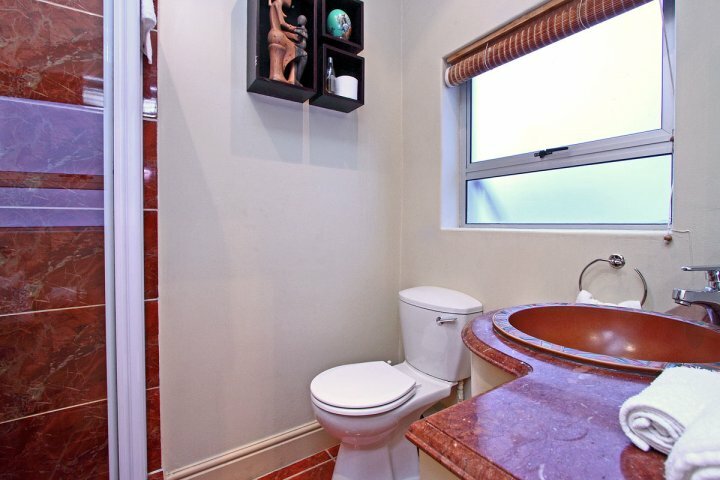 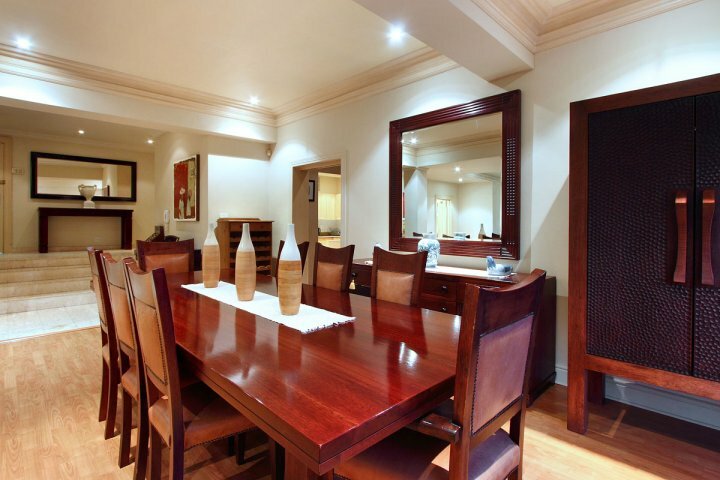 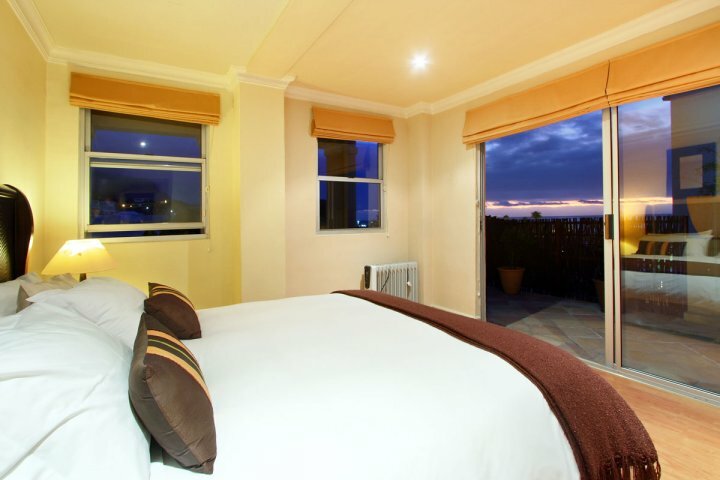 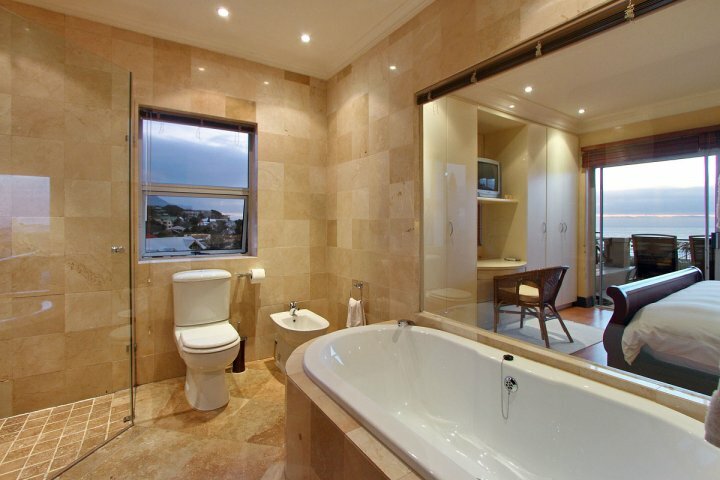 *All the rooms have free-standing colour televisions with DSTV/satellite television and hairdryers. 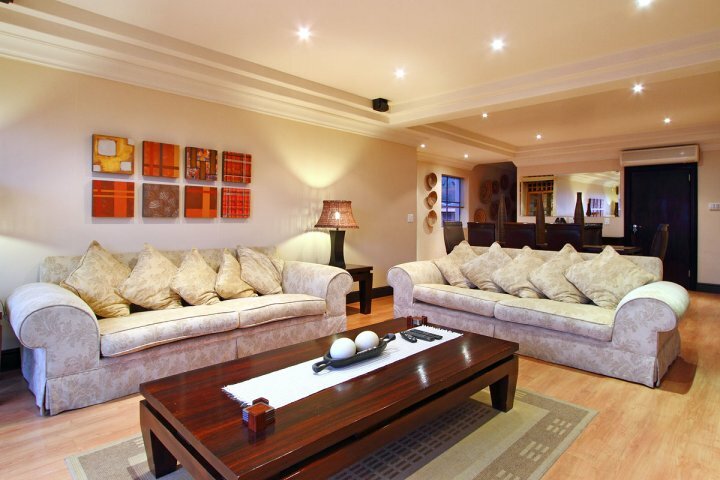 Large lounge/dining room fitted with a safe, state of the art audio and TV equipment, a bar, and lead out onto a wrap around patio. 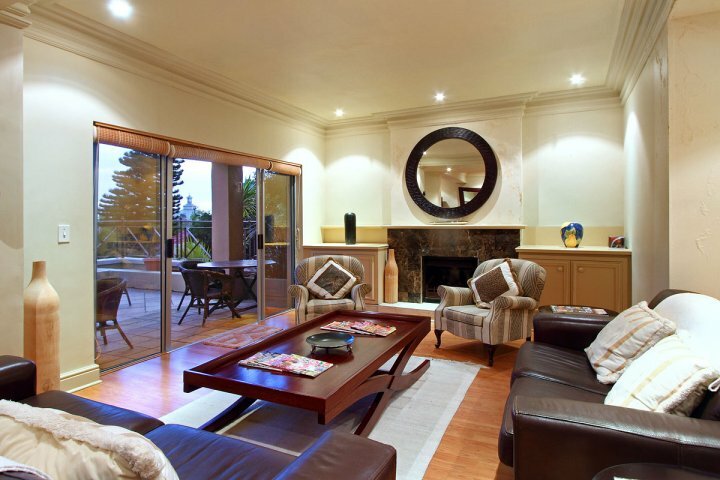 Spacious living area and an open plan kitchen connected to patio. 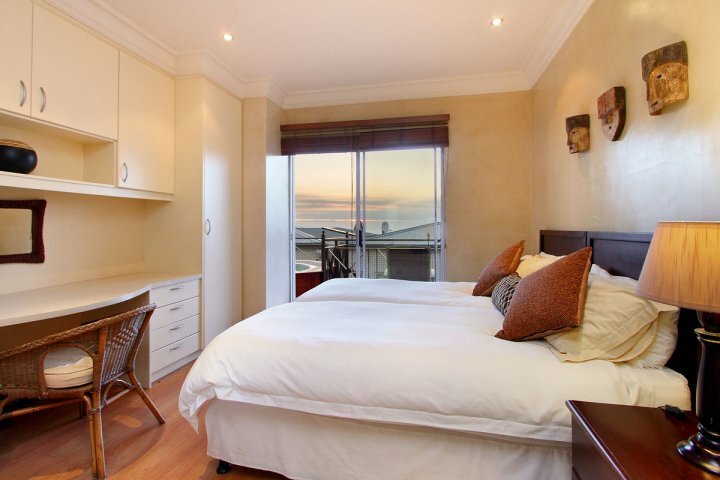 Bedroom 8: double bed with en suite. 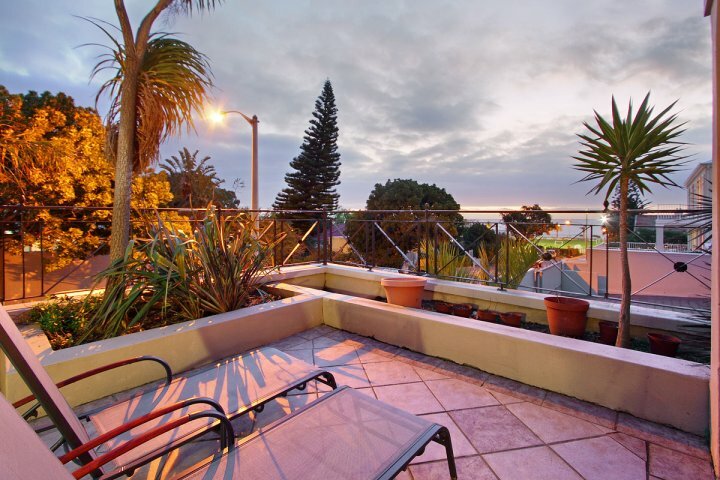 Off-street parking for another 3 cars. 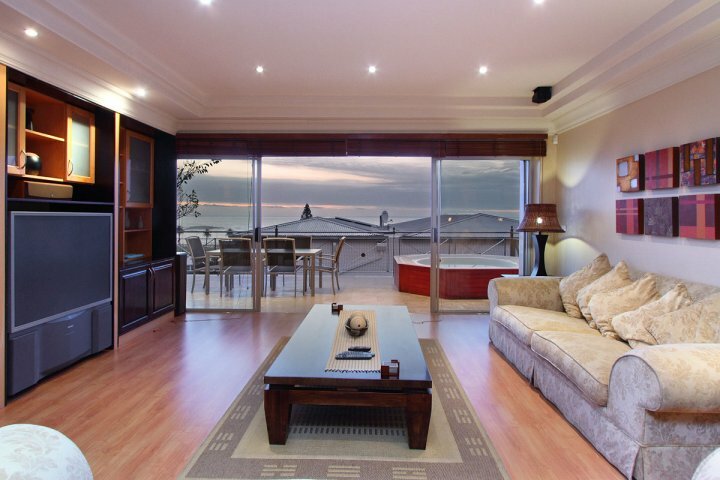 Ready to stay at BEACH SIDE VILLA AND PENTHOUSE?